Photos by Karen Klein ©Karen Klein 2004; all rights reserved. PENNBROOK FARM, established in 1968, is a thoroughbred nursery owned by Frank Penn, who also farms hay and tobacco on 300 acres. The property previously belonged to Dr. Bill McGee, a founder of the Lexington veterinary practice Hagyard, Davis and McGee. Many Grade 1 winners and over 40 stakes winners have been born and raised at Pennbrook, including Listening, Success Express, Affluent, and Greenwood Lake. BAYAKOA was bred by Haras Principal in Argentina, and born in 1984. Her sire was Consultant's Bid, and her dam Argentinian-bred Arlucea, by Good Manners. Her first two seasons on were spent in Argentina, where she was a champion miler; imported into the U.S. for Mr. and Mrs. Frank Whitham, she won eight of her nine starts at age five, including the Spinster Handicap and Breeder's Cup Distaff, and was Champion Older Female of her year. She was champion again at age six, repeating her Breeder's Cup Distaff victory, the Spinster, and other races, carrying the high impost of 127 pounds in two of her victories. She ran three more times at age seven, and was then retired from the turf in 1991 with winnings of $2,856,414, having won 21 of her 39 starts during her career, and placing second 9 times. She produced just four foals before developing severe laminitis, and was euthanized in 1997. 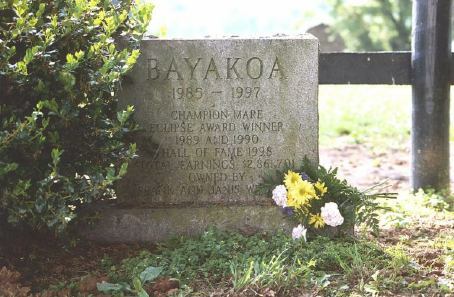 The great broodmare AU PRINTEMPS (1979-2005), winner of the British Columbia Oaks and good handicaps, was also laid to rest here. She was the dam of seven winners, including Breeders Cup juvenile winner and now Australian sire Success Express, champion Canadian grass horse Charlie Barley, and the good juvenile Greenwood Lake, now a sire in Kentucky. --P.E.